For most outdoor cooks, barbecued ribs occupy a place outside the typical comfort zone of hamburgers, steaks, and chops. The intricacies of slow-cooked, smoky barbecue seem shrouded in mystery. What with all the insanely complex spice rubs, glazes, and sauces, plus the vagaries of tending live fires, it’s a cult better left to the pros, right? Wrong! I’m here to open the doors to the inner sanctum of the barbecue world and show you how easy pork ribs can be. Your biggest obstacle is time. That’s it. Just the time it takes for the rib meat to surrender its grisly texture and collapse into tender shreds of succulence beneath a slightly crisp and caramelized surface. If you’ve got time and an outdoor grill, you can barbecue great ribs. Start by choosing your ribs. Pork is traditional for barbecuing, and the two most popular choices are baby backs and spareribs. Baby backs, also known as top loin or loin back ribs, are smaller (2 to 2-1/2 pounds per rack) and more expensive. They’re cut “high on the hog,” near the backbone, where pork chops and tenderloins come from, so they’re usually more tender. Spareribs are larger (4 to 5 pounds per rack, untrimmed) and less expensive. They come from the belly of the animal, close to the section that’s turned into bacon. They’re usually meatier, fattier, and more flavorful. 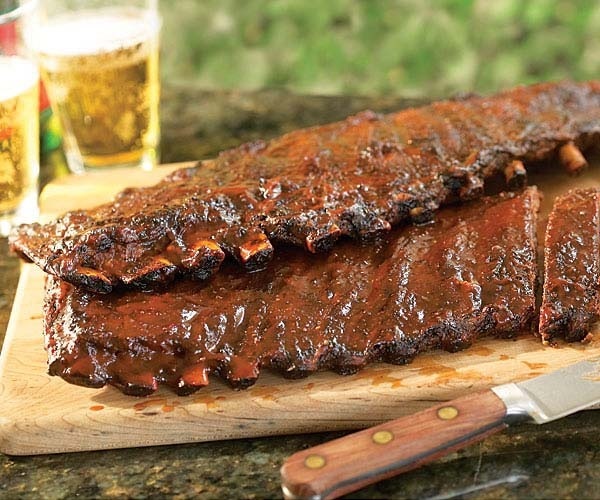 I like to barbecue St. Louis-style spareribs, which are regular spareribs minus a few chewy odds and ends: the breastbones along the bottom, the pointed tops at one end, and a strip of scraggly meat dangling from the bone side. If your store has only regular spareribs, ask the butcher to trim them St. Louis-style for you. Truly great ribs are layered with the flavors of a rub, a mop, and a sauce. I’ve given you recipes for two different but classic combos that balance sweet, spicy, salty, and savory flavors. My goal is a series of harmonic supporting flavors that complement the most important thing of all—the inherent flavor of the meat. When your ribs are done is largely a matter of taste. As a judge at many big barbecue competitions, I’ve tasted my share of ribs. For me, the very best ones are really tender but not so tender that the meat is falling off the bone. I like a little chew left in the meat, and that’s the doneness test I’ve given in my recipe. Baby backs require three to four hours of cooking from start to finish. Spareribs take four to five hours. That’s the main difference; otherwise, the technique for barbecuing either is essentially the same. If you prefer more tender ribs, just cook them longer. In addition to a gas or charcoal grill, you’ll need a few other items. Check a hardware store or FreshFinds.com. Whether you’re making baby backs or spareribs, some racks take longer to cook than others, so you’ll want to be flexible about your serving time. To have the ribs ready by 6 to 7 p.m.
1. Start barbecuing spareribs at 1:30 p.m. or baby backs at 2:30 p.m.
2. About an hour before your start time, soak the wood chips, season the ribs, and prepare your grill fire. 3. Make the mop and sauce during the first hour of cooking. 4. Have your side dishes ready by 6 p.m., and choose dishes that won’t suffer if they have to wait for the ribs. If a side dish needs reheating, do so while the ribs rest.